Gallery 505 is Calgary’s newest public art venue, curated by the Calgary Allied Arts Foundation (CAAF). 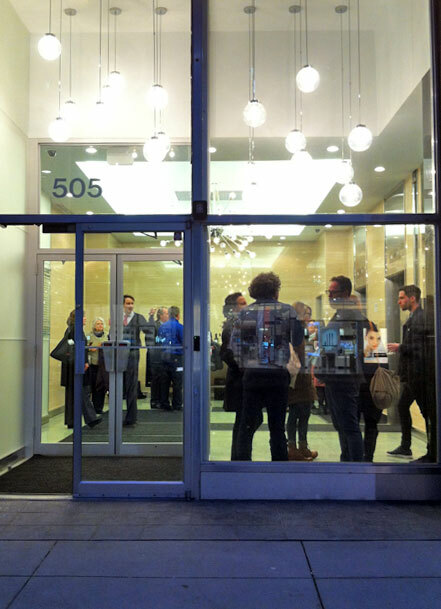 This new gallery space is known as Gallery 505, which is a reference to its street address at 505 – 8th Ave SW. This high pedestrian-traffic area will now give CAAF a street presence and extend our footprint into the Calgary cultural scene. Here on display, you will see artworks on loan from the Civic Art Collection, as well as previous participants from CAAF’s Artist in Residence Program. The Civic Art Collection contains over 1000 works of art and the collection is the pride and joy of The City of Calgary. For many years, CAAF has provided acquisition funds for the collection, which has allowed the number to grow. Acquisition funds for these purchases come from bequests left to CAAF by Calgary artists H.B. Hill, Wes Irvin, Douglas Motter, and Jim and Marion Nicoll. In the Civic Art Collection are many paintings, original prints, drawings, photographs, glass, ceramics, textiles, mixed media, site specific works and outdoor sculpture. The artworks date from 1850 to the present and include the names of some of Calgary’s most recognized historic and contemporary artists. The Artist in Residency Program was designed by CAAF to encourages the development of art and culture to practicing artists in and around Calgary. By supplying studio space in the Cannery Row building and monthly funding, emerging artists may grow in their practice and exhibit on a greater scale with the assistance of the Foundation. A non-profit organization with a volunteer board and membership, CAAF is keen to see the visual arts in Calgary flourish and Gallery 505 is its most recent initiative, thanks to gift of long term space. Here at 505, you will see a new display of artworks every three to four months, not only from the City’s collection, but from artists active in CAAF’s Artist in Residency Program. The footprint for the gallery is not large but it is dynamic (think the + 15 Windows in the Epcor Centre). Every aspect has been considered from the design of the interior to the environmental concerns associated with displaying artwork. We are ever so grateful to 679 Capital for seeing Gallery 505 come to fruition. By collaborating with 679 Capital, we hope to enrich the community in the core and further promote Calgary’s vibrant art scene.